Samsung Galaxy S4 vs Apple iPhone 5! Who is winner? Samsung has presented the Galaxy S4 the ultimate iPhone killer? 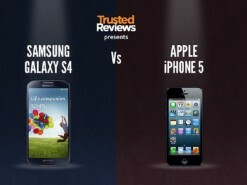 BILD.de shows what the new Android super-phone can do and where it is Apple’s iconic phone over and inferior. The tack-sharp AMOLED screen on the Samsung phone measures five inches (12.7 cm) and has a superb full-HD resolution (1920 x 1080 pixels). It comes down to a pixel density of 441 ppi. The iPhone 5 cannot compete here: The display comes with a crooked resolution of 1136 x 640 pixel resolution at 326 ppi – HD video must be scaled. The Samsung Mobile Phone potter – depending on the region – four or eight cores. No matter which chip is employed: The Galaxy S4 is likely to be currently one of the fastest phones – if not the fastest. The A6 processor of the iPhone 5 is expected from the pure computing power at a disadvantage, however: When Apple phone everything runs smoothly – which application could use eight cores? Samsung plans to equip the Galaxy S4 models with 3G mobile and ultra-fast LTE for speedy browsing. The 13-megapixel camera of the Galaxy is particularly distinguished by additional functions to make the special shooting situations possible. So you can shoot about the same with front and rear camera and combine both images into one image. So you can also get the photographer’s in the photograph as the group picture. The iPhone camera snaps pictures with “only” eight megapixels and provides significantly less features. The plastic housing of the S4 does not look cheap, but also not particularly noble. With its rounded shape but it fits snugly in the palm. To include the 5-inch screen of the Galaxy S4, but it needs large hands and long fingers – it is best to take the second hand added to operate. The iPhone 5 is not only lighter (112 grams) and smaller, but acts with its metal housing also significantly higher quality. One-handed operation is no problem here. On the Galaxy S4, the current version 4.2.2 of the Android system, the Samsung has duly pimped with many functions running. Android sometimes seems a little confused and unstructured. A little training is required. The iPhone 5 is a clear, structured and pleasing in many ways. Even newbie’s come with the Apple smartphone immediately clear. Result: four to two – win on points for the Galaxy S4! In terms of performance, display and functionality currently is hardly a smartphone the Samsung Galaxy S4 approach. In direct comparison, the hardware Samsung mobile phone can easily hold its own against the iPhone fifth but the iPhone is not one for the scrap heap, because the design and operation of Apple smartphone has the nose still ahead. And often this is the very crucial point in the cell phone buying.